ST. LOUIS, MO (KTVI) – As the police cruiser pulled up to the 5 Star Senior Center in South St. Louis, it wasn’t public enemy number one inside, but number 102. “Oh, yes, handcuffs and all,” laughs Edie Simms, 102-years young. That’s right, the little old lady from South County fulfilled a backseat bucket list wish. 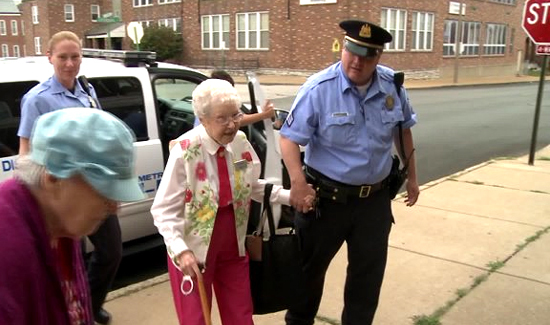 In her 102 years on this earth, she had never set foot in the back of a police car until today. Friday morning she was dispensing pearls of wisdom and free pairs of socks and scarves. “Keep going, don’t ever stop whatever it is you’re doing and spend some time doing community service. Sometimes the person you reach out and touch is the only person that they will talk to in a day,” says Simms.